It's been a week since my last post & wanted to update you on what's going on with me. First off, I cheated. Yes, I cheated, but let me explain why. My birthday was yesterday (I'm 26) and I wanted to be too cute for the weekend, even though I didn't do anything because....anyway, I've wore my hair out for the past few days. 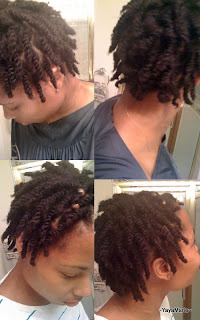 My twistout was sooo pretty! Since I've moved back, my hair is getting some positive attention. *gasp* I know right? I find it quite flattering, especially when you partake in conversation with those alike. I love answering questions and talking about natural hair! So if you see me, don't be a stranger! Recently I have spent a lot of time reading other blogs. Very interesting knowledge that people are communicating across the world. There isn't a day that fails to disappoint me with new knowledge. Update: Oyinhandmade's Honeywash-Neutral smell, lathers well, but not a keeper. It's just ok. I don't do well with ok, similar to settling, so I am going to try some of Inky's products (vegan) and come back in a few weeks with another review. I'm still contributing to my bookshelf. I'll talk about it in a few days. I'm about to call it an early night. Sweet Dreams.